Comparing Neato Botvac D7 Connected vs. iRobot Roomba 980: What Are the Main Differences? You may have heard that iRobot and Neato both offer Wi-Fi supporting vacuuming robots that can be controlled from your smartphone or tablet. 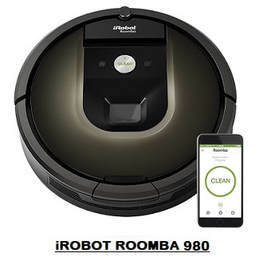 iRobot's Roomba 980 and Neato's Botvac D7 Connected belong to their top level vacuuming robot offerings in the category of Wi-Fi supporting vacuuming robots and they come with a very rich set of features. 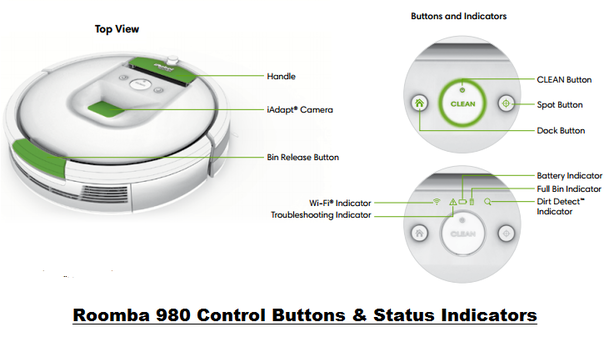 If you were considering to get a Roomba 980 or a Botvac D7 Connected, but were not quite sure which to get, you might find this article useful. Indeed, we will provide you here with a detailed comparison of the two robots, so you can make the right decision and choose the robot that will respond best to your home's vacuuming needs. 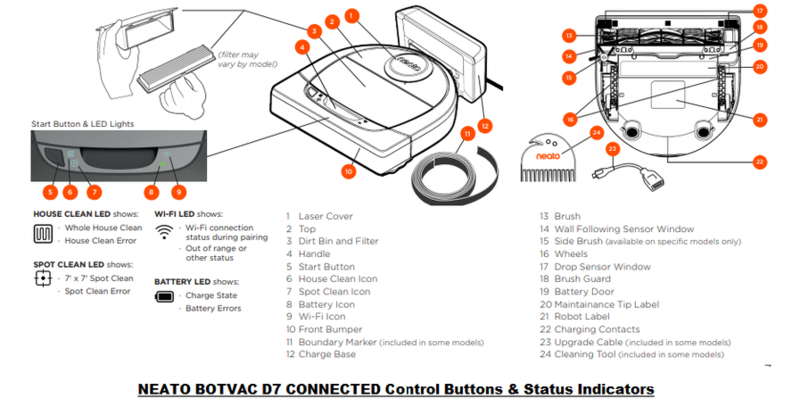 This article will compare the iRobot Roomba 980 and Neato Botvac D7 Connected Robots. iRobot Roomba 980 and Neato Botvac D7 Connected Robots on Amazon. 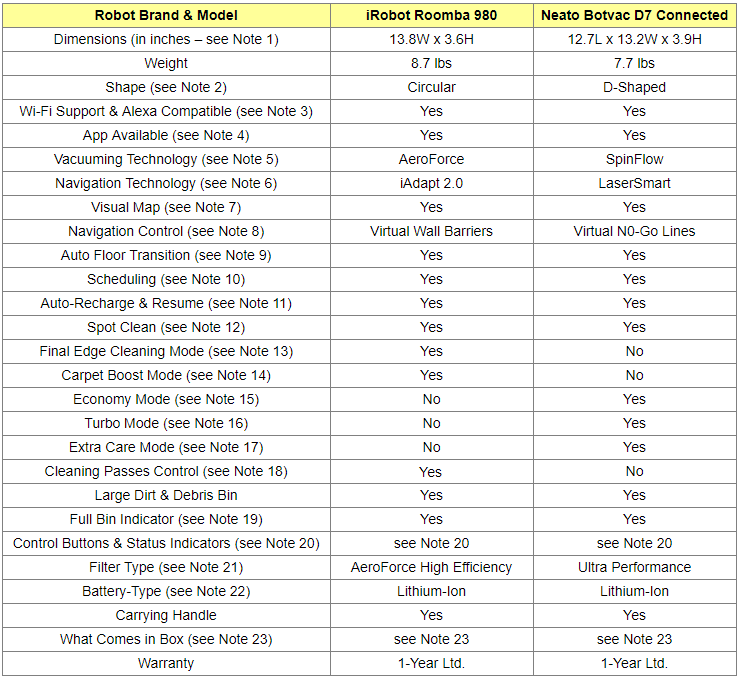 The following table compares the feature of iRobot Roomba 980 and Neato Botvac D7 Connected. Please read the table notes that follow for a better understanding of the feature differences. Roomba 980 is a little bit thinner (only 3.6" in height as opposed to the 3.9" for the Neato Botvac D7 Connected) which means that it can go better under low lying furniture. The Neato on the other hand, is a little bit narrower (13.2" wide as opposed to 13.8" for the Roomba) and therefore can pass better through narrower passages. Both robots are equipped with side brushes, but because Neato Botvac D7 Connected has a semi-rectangular D-shape, it is reasonable to think that it can be even more efficient in cleaning better wall edges and corners. Neato SpinFlow technology used in Botvac D7 Connected combines powerful vacuum suction and precision brushes to leave floors immaculately clean. The robot can be equipped with two types of brushes: a spiral blade brush which combined with Neato's powerful vacuum suction removes easily debris, dirt and fibers, and a side brush for thorough edge cleaning which allows the robot to get deep into corners and right up against walls as well as base boards for superior cleaning coverage. Neato Botvac D7 Connected is equipped with a laser eye that uses infrared light to scan the surroundings and uses the Simultaneous Localization and Mapping (SLAM) technology to build an accurate map of the room and any obstacles. Using this map, the robot is able to efficiently clean the floor in a pattern of straight and overlapping lines, avoiding obstacles, never missing a spot, and cleaning more floor on a single charge. The result is more thorough coverage, faster cleaning, and greater care around furniture, objects, and stairs. Using the app associated with each of these two robots, you can generate a visual map of the space vacuumed that show where your robot cleaned, along with details such as floor coverage summaries. With Neato Botvac D7 Connected, you can also use the map to create Virtual Boundaries in the space to be cleaned to prevent the robot from entering rooms and areas that are not supposed to be cleaned (see Note 8). To prevent the robot from entering off-limit areas, Roomba robots can be used with Virtual Walls which are tiny devices that emit an infra-red beam that the robot will not cross. Roomba 980 does not use any Virtual Walls, but uses Dual Mode Virtual Wall Barriers which, like Virtual Walls, can be used to block off an open doorway, but they can also be used as Virtual Wall Halos which protect some restricted area within the room that may contain things like pet bowls or pile of toys. These units require 2 AA batteries. The 980 robot comes with 2 Dual Mode Virtual Wall Barriers, batteries included. With Botvac D7 Connected, to prevent the robot from entering certain rooms or certain areas containing things such as pet bowls or piles of toys that are not supposed to be cleaned, you can create Virtual Boundaries using the smartphone app and the visual map of the space to be cleaned. These boundaries are called No-Go Lines. Note that, with all Neato Botvac robots, including Botvac D7 Connected, to prevent the robot from entering certain rooms, one can also use Boundary Markers made of magnetic strips that are laid along the entry to off-limit areas. They are simple to use and best of all, they don't require any batteries. Both robots allow scheduling up to 7 times a week, one cleaning for every day of the week. Scheduling is done using the app associated with the robot. When the battery gets low, both robots return to the charging base to recharge. Once recharged, they resume automatically the vacuuming where it was interrupted. This allows seamless coverage of very large surfaces and entire floors without human intervention. Spot cleaning allows the robot to focus on a limited area that requires more intense vacuuming. In Spot mode the robot will clean a 7’x7’ area. Both Robots are equipped with a side brush to clean wall edges. But using the Roomba 980 smartphone app, you can invoke special final edge cleaning action to make sure that stubborn dirt and debris along wall edges are all removed. 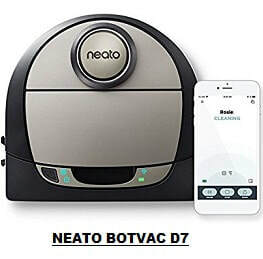 Neato Botvac D7 Connected can be run in Eco mode which is the power saving economy mode and gives you a quiet, longer cleaning. In this mode, the brush and blower are at a medium setting, allowing the robot to clean a larger area on a single charge. This is the quietest mode. The Turbo mode is the default mode in which Botvac D7 Connected runs, In this mode, the robot brush and blower are set to high, providing strong suction and moving at a normal speed. Extra Care is useful if you have delicate furniture or areas your robot has trouble navigating. With Extra Care enabled, the robot navigates more carefully around objects and obstacles. Note that, because in this mode the robot leaves a wider buffer around items like chair legs, it may not be able to get fully underneath some furniture. Both robots notify you when the dirtbin gets full so you can empty it. Roomba 980 is equipped with an AeroForce High Efficiency filter that can capture 99% of allergens, pollen, and particles. The Ultra Performance filter found on the Neato Botvac D7 Connected robot can capture particles as small as 0.3 microns. ​So which robot to buy: Neato Botvac D7 Connected or iRobot Roomba 980? Dual Virtual Wall Barriers used with Roomba 980 to block access to off-limit areas require batteries, while the Virtual No-Go LInes or the Boundary Markers used with Neato Botvac D7 Connected do not require any batteries. It can be operated in Turbo, Eco and Extra Care modes. It has a carpet boost mode which when activated, it enables the robot to detect rugs and carpets and automatically increase the suction power up for a deeper cleaning.